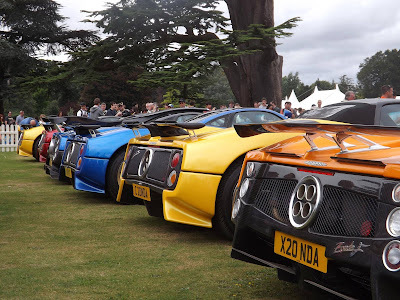 In Sunday 4th August at the latest edition of the Wilton Classic and Supercars 2013 took part 6 Pagani Zonda: #76031 blue S 7.3, #76038 yellow S Roadster, #76043 yellow S Roadster, #76044 red S Roadster, #76070 orange F Roadster and #76106 PS. Unfortunately a seventh car cancelled at the last minute (#76059, the red F with gold wheels). Wilton Classic and Supercars was conceived in 2009 when Lord Pembroke met Jay Broom at one of the latter’s secret supercar breakfast meets, which was bursting the seams of a Surrey pub car park. Lord Pembroke offered a future venue with “a little more space”, and Wilton’s first supercar show was born! With Lord Pembroke’s background in motor racing, industrial design and car collecting, and Jay Broom’s experience and contacts within the supercar world, the aim has always been to provide an enjoyable day out for motoring enthusiasts, of all ages, within a relaxed garden party atmosphere.